Driftwood Villas 305 - Luxury | King Rentals, Inc.King Rentals, Inc. This gorgeous direct ocean unit has all the bells and whistles! Located near the Cocoa Beach Pier, Unit 305 is three bedroom, two bathroom unit with an unobstructed direct ocean views and high-end finishes and furnishings. 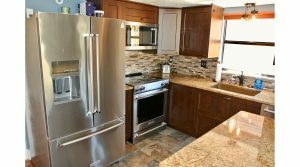 The full kitchen has beautiful granite counter tops, full-sized stainless steel appliances, and bar seating with an open concept leading to the living room. The living room is equipped with a flat-screen smart TV, has a designated office space for your electronics, has an enormous picture window with ocean views, and opens out onto the balcony. The master suite offers a king sized bed, another flat-screen smart TV, sliders onto the balcony, and an on-suite bath with a walk-in shower and double sinks. The second suite offers 2 twin beds, a 3rd flat screen smart TV, and an on suite bath with a walk-in shower. The guest bedroom has a double twin daybed to accommodate additional guests. Each room has bright lighting and stylish modern furnishings; washer and dryer in unit. Driftwood Villas is an oceanfront complex in Cocoa Beach complete with a beach access and immaculately manicured, gated pool deck. The complex is located along the quiet Ocean Beach Blvd, near the Cocoa Beach Pier and with easy access to local shopping and dining, Ron Jon Surf Shop, and much more. Orlando, parks, and international airport are a quick, 45-minute drive away. Do not hesitate to contact one of our experts to ask for more information about this propertyContact Us Now! Copyright © 2019 King Rentals - All rights reserved. Site designed by The Rusty Pixel.